After having gone to yet another early morning ultrasound on June 20, I stopped at Subway to buy a sandwich for lunch later. Getting in late means skipping your lunch break after all. I was already late, stopping for a sandwich would at least prevent my being cranky as I tried to make it through my day. No harm in that. The doctor performing the ultrasound that day said my one good follicle was at 21mm. After being examined three times in a week, it seemed like we were finally getting somewhere. On Monday it was 16. On Wednesday it was only 18. But sometime in the night, my body seemed to be ready to do it’s thing, and we were at a 21 just the next day. But still, the doctor seemed less than impressed. I suppose because it’s taken so long (it was cycle day 17 by then) to get to this point with the follicle. He mentioned the dreaded trigger shot. They gave me a prescription, but told me not to fill it until we heard back on that day’s blood work results. With this information and a foreboding sense of failure, I drove into the city for that sandwich and to await my fate while at work. At the shop I ordered a foot long on wheat. The woman who had been cleaning the windows asked me about my car. I drive a Nissan Cube, and it draws some attention for it’s very boxy shape. The woman asked me how much it cost and if it was “roomy” inside. I told her approximately the price and how incredibly open it is on the inside. As a throw away conversational side note, I mentioned that we were working on getting pregnant and that we hoped the “roominess” would be helpful when putting a baby in the back. This was a mistake if I wanted to keep my composure in front of Subway at 8:30 AM on a Thursday morning. I suppose I should also mention that the lab had to stick me twice that day because my veins were not cooperating. I had huge wads of gauze with straps of tape on both arms. And I’m sure the desperation, exhaustion and worry was clear on my face. That was it. I was undone. I just mumbled that I might cry if I stayed any longer, and I jumped into the car. I don’t think I left tire marks on the asphalt, but I wouldn’t be surprised if I did. If it does, I think I might. As of this post, I’m on cycle day 29. Almost to the end of my two week wait. Maybe the window cleaning lady’s prayers were just the thing. Maybe this cycle will end the way all the rest have. But either way, I’m grateful for the concern of my friends and family. I just never considered that a stranger, unaware of my situation, would ever have enough space in their heart to whisper words of hope on my behalf. And the realization that such good people in the world exist brought me to tears in front of a Subway sandwich shop. 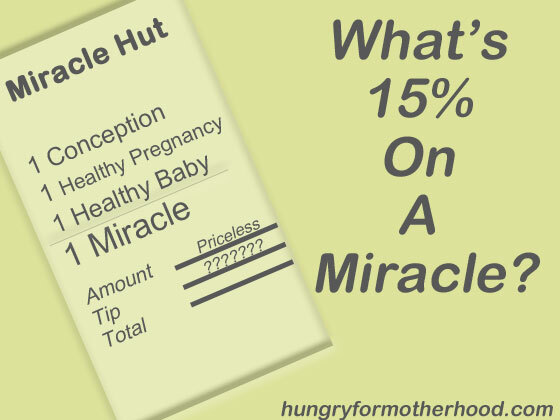 So what’s 15% on a miracle? “Miracle Hut”. I’ve always liked shopping there. Yeah, it’s not near my house so I keep forgetting to shop there. But when I go, I’m always like “I need all of this!” LOL! Love this. What a sweet thing for that lady to say. I’m on Day 30 – we’re cycle buddies! I’m out of this game though. The dreaded brown spotting started. Sorry to hear it. But I do like the idea of a cycle buddy. 🙂 She was very sweet to say it. I’m serious about tipping her. LOL! You’re right. I’m upping it to 20% in my mind now. maybe she was an angel in disguise. Its been known to happen.